Akshaya and Mayur gave birth to twin babies (female and male) but unfortunately their twins were born premature due to which they are suffering from severe respiratory issues. Both the twins are on ventilator support at the moment and are likely to remain in the hospital for another 12 weeks. The total cost of treatment both is around 2520000 Rs (1260000 each twin). As of now both babies are out of danger. Our baby boy underwent an operation on his right eye but the operation failed and he has lost complete vision from his right eye. We are nor focusing on his left eye. The doctor has asked us to wait for 1-2 months before they take a call on the future course of treatment. They have also referred doctors in UK and US that will be able to do the treatment. We have approached them but the treatment will require more funds. I request you all to please share this campaign in your network so we can raise more funds for his treatment. Thank you all for the overwhelming love and support towards the babies. Both the twins are presently stable. The boy had to undergo bronchitis operation due to some problems and also underwent an operation for both his eyes in Chennai. Unfortunately, the operation for his right eye failed. We are looking for more hospitals where his treatment can be done for the same. 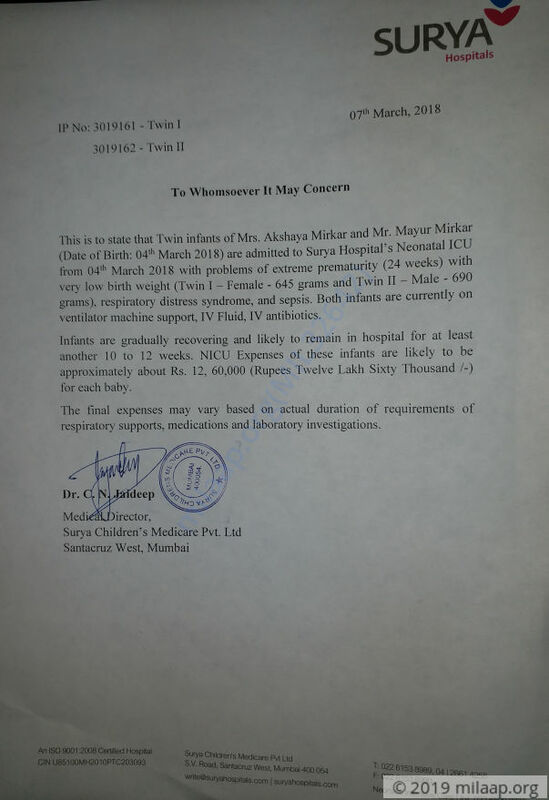 Baby of Akshaya Mirkar twin I (female) is currently 42 weeks and 3 days corrected age. She had respiratory distress syndrome, late onset sepsis, growth restriction and hyperglycemia. Currently, she is in room air, and started taking oral feeds over the past 2 days. Current weight is 2225gms. 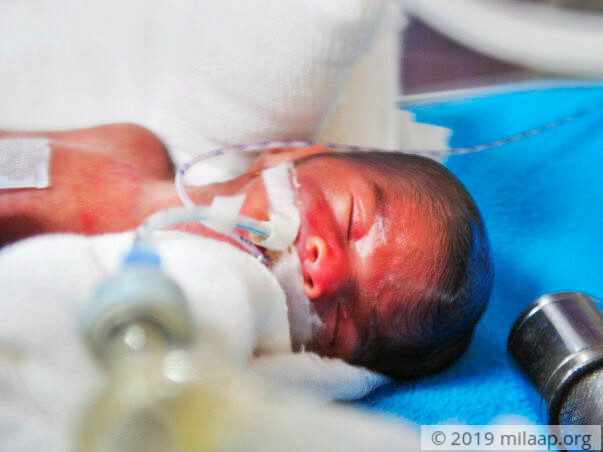 Baby of Akshaya Mirkar twin II (male) was discharged home and then readmitted on 4/7/2018 with bronchiolitis. Currently infant is on CPAP support and adrenaline and budecort nebulisations and tolerating tube feeds. Current weight is 3.25kg. We will keep you further posted on the condition of both the babies.